Highly bioavailable vitamin B9 supplement. Supplementation strongly recommended during pregnancy. Form of vitamin B9 with improved bio-efficacy. Quatrefolic® is a form of vitamin B9 with excellent bioavailability which does not produce elevated levels of unmetabolised folic acid, the long-term effects of which have yet to be determined. 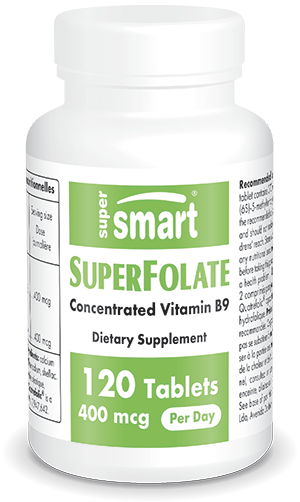 SuperFolate consists of a new form of Quatrefolic® vitamin B9, providing (6S)-5-methyltetrahydrofolic acid. In March 2014, the European Commission approved this new form of vitamin B9 as a Novel Food Ingredient for use in dietary supplements following the EFSA’s favourable opinion delivered in October 2013, and DFA approval of Quatrefolic® as a New Dietary Ingredient in 2010. Quatrefolic® - the fourth generation folate - offers improved water-solubility as well as optimal bioavailability compared with other forms of folic acid because it does not have to be metabolically converted and is thus immediately available for use by cells. Neither does it produce increased levels of unmetabolised folic acid, the potential long-term effects of which are still the subject of scientific debate, and is therefore completely safe. The conversion of folic acid into 5-methyltetrahydrofolate is mediated by the action of enzymes but these can become saturated when high levels of folic acid are ingested over long periods. Indeed, long-term supplementation with standard folic acid-based products may accelerate the development of cancer in people with pre-cancerous lesions or tumours. SuperFolate therefore represents a completely safe form of vitamin B9 with all the known properties of folates naturally present in the diet. The importance of B9 is well-established – the vitamin has been widely studied in young women and mothers-to-be in order to ensure healthy fœtal development and reduce the risk of neural tube defects. Lack of vitamin B9 is recognised to be among the most common deficiencies and it is vital to ensure women of reproductive age have a regular and adequate intake. Like methionine, folates are key elements in the DNA methylation cycle, also known as one-carbon metabolism, which is essential for normal cell function. Folates thus act as major coenzymes in the transfer of monocarbonated groups (CH3). They help protect against genetic aberrations which may lead to the development of cancer, and also help the body synthesise proteins which destroy cancerous cells. There is now conclusive proof that deficiency in folates and vitamin B12 affects methylation processes. Combined with vitamin B12, folates also ensure that homocysteine is converted into methionine, which is essential for healthy cardiovascular function. It is therefore better to supplement with 5-methyltetrahydrofolate than folic acid because the former is available immediately to react with homocysteine and thus prevent hyperhomocysteinemia. • and problems of the central nervous system such as cognitive impairment, age-related memory loss and depression, due to improved transport across the blood-brain barrier. SuperFolate is therefore the most active form of vitamin B9 available today as well as the safest. Studies have highlighted its key role in cell growth, DNA synthesis and red blood cell formation. Each SuperFolate tablet contains 370mcg of Quatrefolic® providing 200 mcg of (6S)-5-methyltetrahydrofolic acid. Taking two tablets a day with meals can provide a powerful defence against various age-related diseases. Other ingredients: calcium carbonate, stearic acid, maltodextrin, sodium croscarmellose, shellac. Adults. Take 2 tablets a day, or as advised by your therapist. Each tablet contains 370 mcg of Quatrefolic® providing 200 mcg of (6S)-5-methyltetrahydrofolic acid.